Strong ties developed during the Cold War can expand even further under Modi’s Act East Policy. Cambodian Prime Minister Hun Sen will visit India on January 24 to attend the India-ASEAN commemorative summit, which celebrates last year’s 25th anniversary of Indian-ASEAN dialogue relations. He will also join other nine ASEAN leaders as chief guest at the India’s Republic Day. Hun Sen is likely to hold bilateral talk with his Indian counterpart, Narendra Modi, on the sideline of the summit, during which both leaders will discuss a wide range of issues including bilateral ties, defense cooperation, and connectivity projects. Cambodia-India relations have been growing significantly over the past years, and Hun Sen’s visit will pave the way for further strengthening bilateral relations, which have been built on mutual trust and the principle of non-interference. Cambodia and India have enjoyed friendly relations for a long time. Both countries formally established diplomatic relations in 1952, with the first visit to the newly independent nation by an Indian prime minister in 1954. In late 1954, Cambodia’s late King Norodom Sihanouk reciprocated an official visit to India just a few months ahead of Bandung Conference. It should be noticed that both countries were architects of the non-aligned movement. King Sihanouk’s neural foreign policy was heavily inspired by India’s Jawaharlal Nehru, whose government followed the principles of respect for sovereignty, territorial integrity, neutrality, and non-interference. The King regarded Nehru as his teacher and brother, mentioning that he had a lot to learn from the Indian leader. Despite close relations, ties between New Delhi and Phnom Penh were disrupted after genocidal Pol Pot regime took control of the country in 1975, but finally resumed in 1981. After the fall of Khmer Rouge regime, India became the first country to recognize the Phnom Penh government of the People’s Republic of Kampuchea led by Heng Samrin. At that time, Europe and the United States had turned their back on the Cambodian people and also imposed diplomatic isolation and economic embargoes against the Vietnam-back regime in Phnom Penh. According to the book Strongman: Extraordinary Life of Hun Sen by Harish C. Mehta and Julie Mehta, Indian Prime Minister Indira Gandhi, who came to power after winning the election in 1980, decided to normalize relations with the Phnom Penh government. Her predecessor, Moraiji Desai, had refused to recognize the Cambodian government during that time and demanded that Vietnam withdraw its troops from Cambodia. Under Gandhi, then-Indian Minster for External Affairs Narasimha Rao said Cambodians needed more support from international community, both diplomatically and economically, during a difficult time. This made India one of the few friends Cambodia could rely upon in order to survive economically during the Cold War era. Above and beyond the recognition of the People’s Republic of Kampuchea, India, under Rajiv Gandhi’s premiership, made noteworthy contributions to Cambodia’s peace process, taking both constructive political and diplomatic roles to bring about the withdrawal of Vietnamese forces from Cambodia and a peaceful settlement to Cambodia’s conflicts. 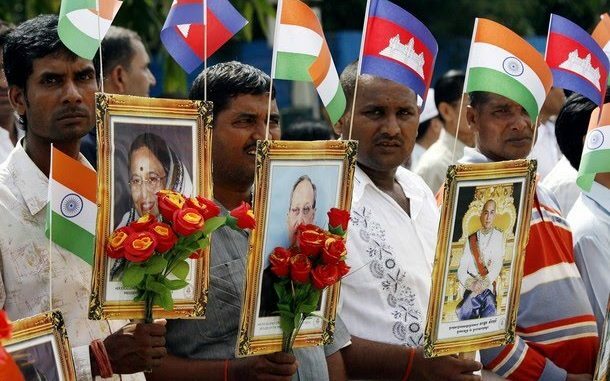 In particular, India acted to facilitate dialogues between Cambodian political factions. In October 1987, India sent Natwar Singh, the country’s minister of state for external affairs, to meet with the former head of state, Sihanouk, in New York. The meeting was regarded as a very important confidence-building measure, paving the way for the Paris meeting between Sihanouk and then-Foreign Minister Hun Sen for the first time in December 1987. Hun Sen decided to visit India to hold talks with Rajiv Gandhi before he met Sihanouk in January 1988 for the second time in France. The talks between Hun Sen and the monarch, with India’s mediation, helped kick-start regional efforts to broker peace in Cambodia. India’s recognition of the Phnom Penh government and effort to support peace-making in Cambodia are still very vital elements in today’s relationship between India and the Cambodian government headed by non-Prime Minister Hun Sen. Hun Sen respects and acknowledges India as a very trustworthy friend and partner, and hails India’s consistent practice of the principles of neutrality and non-interference. In 2000, the Cambodian premier also avowed his full support for India to become a permanent member of the United Nations Security Council (UNSC). Over the past years, Cambodia has been moving closer toward Beijing’s orbit, as China becomes Cambodia’s largest trading partner and plays an increasingly essential role in the country’s development. But with the emerging role of India in the region, Cambodia needs to balance relations with both Asian powers to secure maximum benefits, ranging from economics to security to politics. It’s worth noting that India’s lack of a substantive role in the region has left a vacuum for China to fill in recent years. However, with the transformation of “Look East” to the “Act East Policy” under Modi’s leadership, India can regain its footing in Southeast Asia, by courting Southeast Asian countries in an attempt to balance China’s rising influence. India, of course, is set to continue to deepen economic and cultural integration with Southeast Asian countries to assure the success of Act East. But it still remains to be seen if India’s Act East can match China’s Belt and Road initiative. In the future, India will play a very vital role in promoting to “free and open Indo-Pacific” concept, through its diplomatic leadership and economic power. Least developed countries like Cambodia will find it important to keep close ties with major countries like India. By 2027, India is projected to become the third largest economy in the world, and it is also the fastest growing major economy in the world. As total trade with India amounted only to $153 million in 2016, Cambodia will need to bolster trade and commercial relations. There is still a lot of room to improve, especially considering the low level of Indian investment. In term of defense, India, as a newly emerging power, will also be more active in fighting against terrorism, transnational crime, and extremism, ensuring security, stability, and peace in the region. With the unexpected revival of the four-way security dialogue, commonly known as the the Quad, which consists of Japan, Australia, the United States, and India, it is expected that India will increase its efforts to defend the so-called “freedom of navigation and overflight” and “rules-based international order,” especially in the South China Sea. Cambodia’s defense ties with India have been growing in recent years, with frequent goodwill visits by Indian naval forces. In this regards, Cambodia will, if it can keep up the momentum, benefit from greater defense cooperation with India. Further, Cambodia can learn a lot about fostering democracy and the rule of law by forging close ties with India, which is the largest democracy with a population of 1.2 billion. Regardless of its extreme poverty and diversity, India has so far attained democratic success, and the country has never plunged into political chaos in recent history. This can prove that least developed countries like Cambodia can afford liberal democracy. By learning from India’s democratic success, Cambodia would be able to improve its governance, increasing accountability, effectiveness, and efficiency in the future. Besides a bilateral partnership with India, Cambodia can further enhance cooperation and relations through the Mekong-Ganga Cooperation (MGC) mechanism. The MGC initiative, which consists of six members — India, Cambodia, Myanmar, Thailand, Laos, and Vietnam — was launched in 2000, aiming to shore up cooperation in the areas of tourism, culture, education, and transport. Over the past years, through the MGC, India has contributed a lot to human development in CLMV countries, and its firm support has also contributed to the successful implementation of ASEAN 2025, which aims at narrowing the development gap among ASEAN members. Within this framework, Cambodia should continue pushing for more technology transfers and connectivity development. Sao Phal Niseiy is a Cambodian journalist who covers foreign affairs and international politics.